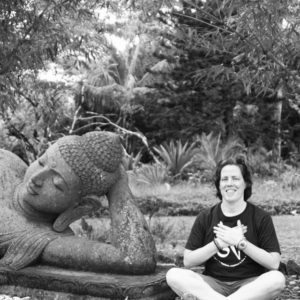 Seven years ago, I began planning a week-long retreat that would take place on the Big Island of Hawaii. I wanted to spend a week exploring our wild cosmic heart. I had no idea that a week before the retreat a hurricane would sweep the East Coast. I had no idea that three weeks before the retreat I would have medical appointments and not feel well. I had no idea that my heart would feel so heavy and raw. In November of 2012 as I prepared to leave for my flight, I thought of canceling – of staying home to help family and friends affected by the storm. I thought about how I would reschedule my medical appointments that were canceled due to the power outages from the hurricane. I thought about volunteering somewhere to help hurricane victims who lost everything. When I asked friends if I should still lead the retreat, they all gave the same answer – YES. I listened and took an 11-hour flight to Hawaii. I arrived exhausted and anxious. When I arrived at my room, two large geckos were awaiting me. I barley slept my first night and, in the morning, I met with the Group Manager. She greeted me with a big hug and my eyes filled with tears. As the week continued I knew I was in the right place (not only because it was Hawaii). I met so many people willing to explore their hearts. I met people who were open to being seen and heard. I met people who were willing to be vulnerable. As I sat and listened to the retreat participants, I became more in awe of the many people who live their life celebrating and tending to their wild cosmic heart. I met Louise whose husband was dying of brain cancer. I met Yolanda who celebrated her 75th birthday with friends and a group of strangers. I watched Tina snorkel with joy as she swam in the warm ponds. I smiled as Angela took her first hula class. I listened to Francine remember that she can drum and sing. I took a picture of Susan sitting in her shamanic earth mandala, which she made in the roots of a huge tree. I laughed with Lisa in the water, like a teenager with the giggles. Most of all, I remember that my heart felt open and grateful. I realized that when I open and invite others into my heart, the world expands. Many in the our sacred circle were longing for connection, community, and belonging. The Wild Cosmic Heart Retreats offers just that — deep connections through guided meditations, mindfulness walks around trees, shamanic journeying to the garden of the heart, and sacred play. In the midst of worry and responsibility, participants from around the world were willing to drop the armor around their heart. I even befriended the Geckos, known to me as Heckle and Jeckle. The retreat was so powerful that I have taught it again and again. And this November, I will be facilitating the Wild Cosmic Heart Retreat at Kalani on the Big Island of Hawaii, November 4-10, 2018. Join us for a week of daily meditations, mindfulness walks in the luscious tropics, shamanic journeying, and homemade ice cream! What is your wild cosmic heart asking of you? It’s a Thursday night in the Catskills. Almost 400 people have traveled from around the world for a summer camp for adults, known as Camp Good Life Project (Camp GLP). The evening gathering includes an all camp bonfire, full of s’mores and singing. While most of the campers are in a team-building activity, I am in my room sorting stuff, calling home, and getting my instruments ready. I bring my djembe from home in the hopes of playing at the sing-a-long. I walk to the area where the campfire will be as it is right near my room. A small group of folks have gathered and are trying to keep the fire lit. It had rained earlier in the day and the ground is wet. Most of the flames are now just smoke. The camp staff who lit the fire have left along with all the supplies. The small group scrambles to get the fire lit before the massive group of campers come to gather. I bend down and hold out my hands to hold space. Campfire and all, it is still a fire. It’s sacred. The bonfire is the big kickoff for the weekend. With hands open, I send my blessings to the fire. I look to my left and a woman is bent down blowing into the open space. She starts moving sticks and creating an opening for the fire to catch. Other folks are frantically looking for a lighter, matches, anything to help keep the small flame going. There is a sense of nervousness that the fire will go out. Some suggest we use lighter fluid. A few of us look up and ask that we wait to see if we can get it going by using nature, our intention, and the wood in front of us. Smoke – more smoke. The fire is slowly going down and what seems to be a small ember is left. Again, the offer to get lighter fluid is suggested. 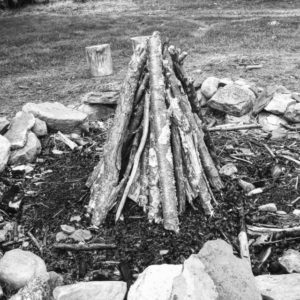 I look now to see my new friend Pam circling around the fire and we both agree that we ought to wait and see if we can get it going ourselves. We realize we have some paper from the s’mores to use that to help get the fire going. I start a small low chant to bless the fire and I realize more people are circling around us. Ember – one ember. Just as it seems the fire will be out altogether, there is one spark of light. Someone calls out in the dark that there is one ember still going. A few folks blow on the ember and we open the logs a little to give it more air. 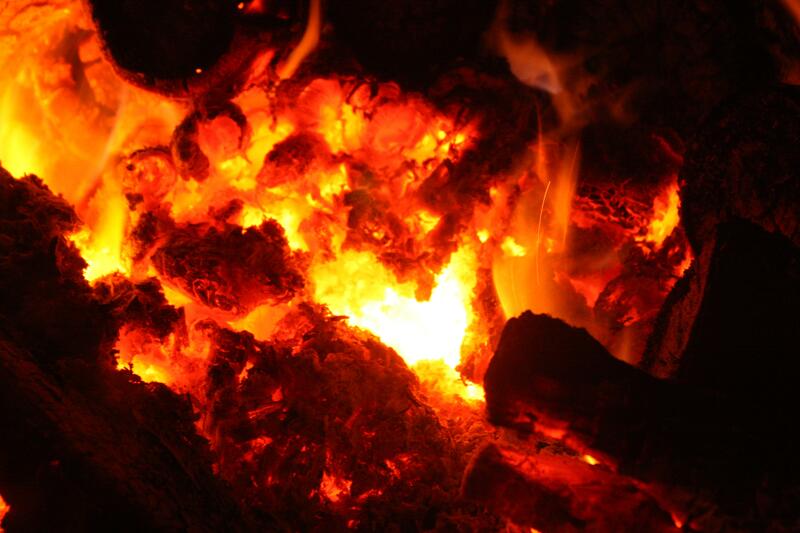 The ember takes and more glow begins to light up our campfire. Fire – we have fire. The fire grows up and out and we begin to clap and hug and laugh. Most of the campers hadn’t realized the effort to get the fire going. All the fire starters gather closer to the flame knowing it was just smoke with one small ember. Love – we are love. It took many hands. It took patience. It took our great will to not give into the easy solution (luckily, there was no lighter fluid nearby) and to just BE with the fire. 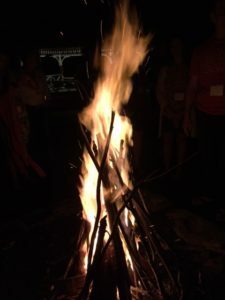 It took time for everyone gathered to realize this was more than a camp fire – this was a sacred fire. And oh, how the fire danced for us. The lessons of the fire are always right in front of us. Just when you think everything is at its most darkest, there is always an ember of light. The fire waits for us. Our breath holds great power. Lean on one another and bear witness. From nothing is everything. From one ember – fire. Dedicated to Pamela Slim who shared in the sacred fire ceremony. Fuego.